A heat advisory for several Bay Area locations continues Sunday. A scorching Sunday furthered a heat advisory and prompted a red flag warning for several Bay Area locations as the region swelters during another summer heat wave. A heat advisory implemented Saturday morning for the Diablo Range, Santa Cruz Mountains, Big Sur region, East Bay valleys and North Bay mountains will remain in effect until Sunday at 9 p.m., according to the National Weather Service. Temperatures in those regions could reach 105 degrees or more. Due to blistering temperatures, gusty winds and low humidity, a red flag warning is also in effect for spots above 1,000 feet where wildfires could ignite and spread quickly. Those areas include North Bay hills, East Bay hills and the Santa Cruz Mountains. Heat sensitive residents are at moderate to high risk of heat-related illnesses and the danger of wildfires will rise with the rising temperatures, according to weather officials. Cooler temperatures are forecast for early next week. The hottest temperatures for inland valleys and ridges will be in the North Bay, East Bay, South Bay and in Monterey and Santa Cruz counties. In the North Bay, interior valleys could reach the low 100s, according to weather officials. On East Bay ridges temperatures are forecast to reach the 90s. The inland areas of the South Bay are forecast to reach the 90s while ridges will be near 100. San Jose will open several cooling centers Sunday across the city. Inland valleys of Monterey and Santa Cruz counties are expected to be in the 90s. The ridges could reach the low 100s. Coastal temperatures from the North Bay to Monterey Bay will be lower, weather officials said. 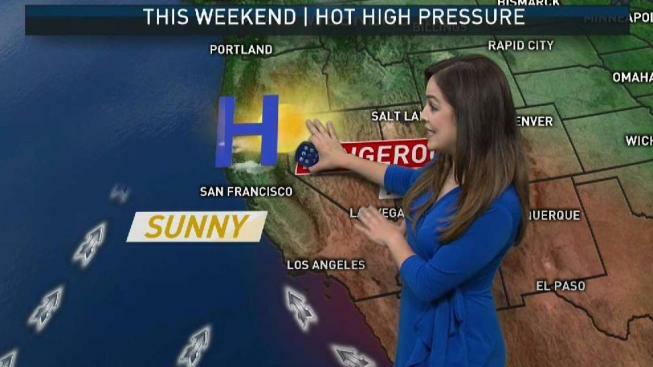 Across the San Francisco and Monterey Bay areas, temperatures in the hilly and mountainous regions could stay above 70 degrees during the night and early morning hours. Weather officials said pets and livestock may require extra care during the heat. The officials suggest residents drink plenty of fluids, stay in air conditioning and out of the sun and check up on neighbors and relatives.